The Recent module is one of the main tool to navigate from one entity (a company, a project, an employee) or your home screen, to another entity. 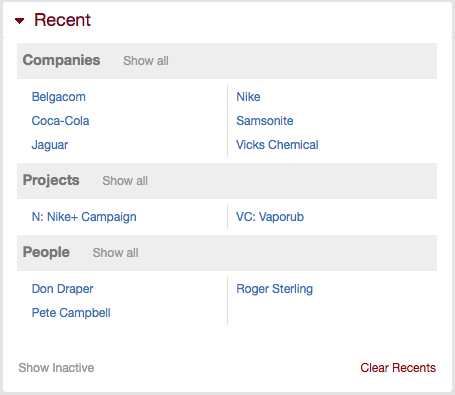 It displays the last companies, projects or employees you have navigated to with a maximum of 10 entities for each entity type. When you click on the entity name, you will navigate to the screen of that entity. If you click on Show all, the module will display all entities existing in your account. By default, only active entities are shown. Click on Show inactive to display active and inactive entities. To reset the last entities list, click on Clear Recents.